David Crosby was a founding member of Crosby, Stills, and Nash, and their first album earned them a Grammy Award for Best New Artist in 1969. 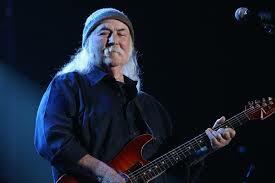 Crosby has earned many gold and platinum records and was inducted into the Rock and Roll Hall of Fame in 1991 with the Byrds and in 1997 with CSN. Crosby’s success was often overshadowed by his personal demons, such as drugs, which he has since overcome. Crosby attended Santa Barbara City College where he studied drama, until he dropped out to pursue a career in music. Following the trend of the time, Crosby quickly found himself in New York’s Greenwich Village, a hub for musicians and artists of the 60’s. A powerful songwriter, Crosby had success early on performing in clubs and coffeehouses, but in 1963, with the help of producer Jim Dickinson, Crosby released his first solo album. He returned to L.A. and joined with folk singers Roger McGuinn and Gene Clark who, along with Chris Hillman and Micheal Clarke, later formed the successful 60’s group The Byrds. Despite the success of the band, Crosby left in 1967. The break occurred as a result of tension between Crosby and his band members over political attitudes expressed openly and aggressively by Crosby on stage at the Monterrey Pop Festival. Crosby’s developing friendship with Buffalo Springfield’s Steven Stills added to the tension between the Byrds members. One night, Neal Young was unable to perform for Buffalo Springfield and Stills asked Crosby to fill in for Young. Crosby agreed, angering McGuinn and Hillman to the point that they no longer wanted Crosby as a member of the Byrds. Upon leaving, Crosby collaborated with Steven Stills and Graham Nash, forming the power group Crosby, Stills and Nash. The trio had immediate success, being praised as “ the voice of a generation” and awarded a Grammy in 1969 for Best New Artists. All three members of CSN enjoyed successful solo careers as well, though often reuniting and performing together. Despite changing trends in music, both Crosby and Nash have kept their fans and continue to perform to this day. As social activist, Crosby has recently appeared in support of the Occupy Wall Street movement and, along with Nash, have performed for the crowds in New York. Crosby has also written a number of books chronicling his life and career as a musician, performing during times of great social change.